When a News Corp newspaper starts writing articles that reflect the insights provided by Modern Monetary Theory (MMT) you know that progress in the dissemination of those ideas is being made. Even if they don’t get things exactly right. The Dow Jones & Company (owned by News Corp) daily, the Wall Street Journal carried an article last week (October 31, 2016) – Message from the Gilt Market: U.K. Can Never Run Out of Pound – which leaves no room for doubt. The London-based journalist Jon Sindreu wrote that “Among facts that take a stubbornly long time to sink in, here’s one: Countries that borrow in their own currencies never have to default on their debt”. So never again allow a person in your company to suggest otherwise. There are many like facts that seem to evade the understanding of journalists, politicians and others who desire to push the neo-liberal line. I say ‘seem’ because it is certain that many of these neo-lib banner carriers know full well they lie when they make claims about currency-issuing governments running out of money and the like. They are ideological warriors after all and in war, anything seemingly goes. 1. The mainstream pundits thought the Brexit vote would see foreigners sell of British government bonds in large quantities. They didn’t. Exactly the opposite has happened. 2. What has actually happened? The exchange rate depreciation has a meant that “British assets have become automatically cheaper to foreigners”. So the adjustment has come from the currency conversion rather than the asset price. 4. Why? Because “Britain is a developed country with liquid financial markets that issues debt in its own currency. Unlike Greece or Spain, which could certainly run out of euros, the U.K. can always print more pounds” (a core MMT proposition). 5. The claims that the central bank is independent and therefore Britain is like Greece is false. The reality is that “the role of central banks has always been intimately tied to managing the government’s debt” (a core MMT proposition). 6. QE has meant that the Bank of England “now owns roughly a third of the £1.5 trillion gilt market”. No inflation or anything other bad things have happened as a result. 7. “Even in the eurozone, the European Central bank has shown it has the power to end bond selloffs” – a point I regularly make. The government is in charge not the bond markets (a core MMT proposition). 8. “Credit-rating agencies have warned for decades about Japan’s ever-growing debt pile, but its bonds continue to trade at record highs”. The credit-rating agencies are charlatans at best. They have no significant interest on the bond dynamics of currency-issuing governments such as Britain or Japan (a core MMT proposition). 9. “sovereign bonds are as safe as cash” as long as the government issues its own currency and only issues bonds in that currency (a core MMT proposition). So lets consider a few of the arguments. Countries that borrow in their own currencies never have to default on their debt. But then it goes on to claim that the “last few months have tested this notion again”. As the article notes, these predictions of doom were very, very wrong. In macroeconomics, we summarise the plethora of public debt instruments with the concept of a bond. The standard bond has a face value – say $1000 and a coupon rate – say 5 per cent and a maturity – say 10 years. This means that the bond holder will will get $50 dollar per annum (interest) for 10 years and when the maturity is reached they would get $1000 back. Bonds are issued by government into the primary market, which is simply the institutional machinery via which the government sells debt to the non-government bond dealers. Once bonds are issued they are traded in the secondary market between interested parties. Clearly secondary market trading has no impact at all on the volume of financial assets in the system – it just shuffles the wealth between wealth-holders. Please read my blog – Deficit spending 101 – Part 3 – for more discussion on this point. Accordingly, the government would determine the maturity of the bond (how long the bond would exist for), the coupon rate (the interest return on the bond) and the volume (how many bonds) that was being sought. If the private bond traders determined that the coupon rate being offered was not attractive they would not purchase the bonds. The central bank, typically, would then step in an buy up the unwanted issue. Under the auction system, the issue is put out for tender and the market would determine the final price of the bonds issued. Imagine a $1000 bond had a coupon of 5 per cent, meaning that you would get $50 dollar per annum until the bond matured at which time you would get $1000 back. The reason long-term yields would be rising in this case is because investors were diversifying their portfolios and moving back into private financial assets. But all of that has nothing to do with the real resource costs embodied in goods and services that governments purchase. Which bears on the claim in the WSJ article that a declining demand for government bonds drives “the government’s borrowing costs to skyrocket”. For a sovereign government that issues its own currency there is no binding revenue constraint on government spending. The interest servicing payments come from the same source as all government spending – its infinite (minus one cent!) capacity to issue fiat currency. There is no ‘cost’ – in real terms to the government doing this. The concept of ‘more or less expensive’ is therefore inapplicable to government spending in this situation. The cost of government spending is the real resources that are deployed in the production of the goods and services being purchased rather than the fiscal balance entry in the Treasury books. Rising bond yields do not measure these opportunity costs. 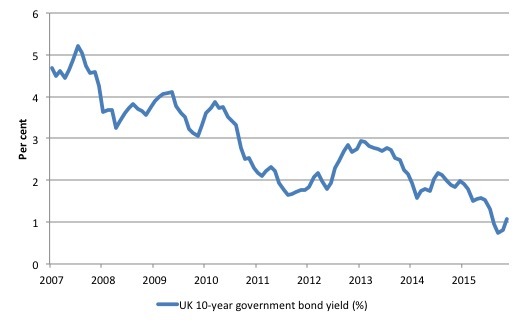 The following graph shows the movement in the British 10-year government bond yield from January 2007 until September 2016. In June 2016, the ten-year bond yield was 1.3105 per cent. It dropped to 0.8243 per cent by the end of September 2016 as demand for bonds increased. By the end of October 2016 it had risen slightly to 1.078 per cent. Nothing significant is going on here. Another way of assessing the taste for British government debt is to consider the so-called bid-to-cover ratio. The bid-to-cover ratio or the coverage ratio is the value of the bids relative to the tender amounts of the bonds being issued. A ratio of 1 means that there is enough demand to match the issuance intentions of the government. The coverage ratios are typically high for the Australia, US, the UK, Japan and most nearly all sovereign nations where the relevant data is publicly available. The long history of bid-to-cover ratios in the bond markets of currency-issuing nation suggest that the investors cannot get enough public debt. When debt levels start falling below some level (that will provide liquidity to futures markets, for example) the private bond traders demand the government issues more debt even if they are running surpluses. A word of caution. Even using the ratio assumes it matters. The reality is that as the British government is not revenue-constrained (it issues its own currency), it could abandon the auction system whenever it wanted to if the ratio fell to 0.00001. It is also highly interpretative as to what the ratio signals. It certainly signals strength of demand but how strong becomes an emotional/ideological/political matter. There is also no basis in the statement that a ratio above 3 is successful and by implication a ratio below 3 is unsuccessful. After all, anything above 1 tells you that some investors do not get their desired portfolio. That sounds like a failure to me. The bid-to-cover for British government gilts is not plunging. The large pension funds have been falling over each other to keep stocking up on government debt because they know it represents more corporate welfare! Indeed, in the May 5, 2016 auction for 10-year bonds, the bid-to-cover ratio was 1.79. The ratio in the July 7, 2016 10-year bond auction rose to 2.33, indicating a rise in demand for the assets. In the September 6, 2016 auction, the ratio was 1.73 and 2.01 in the October 19 auction. The WSJ article then documents the recent movements in the so-called ‘gilts market’ in the UK, and, in particular, the reduced holdings of foreign residents. Because they own about a quarter of the market, the U.K. Treasury itself said this could be a serious problem. Which really just goes to show that H.M. Treasury is a source of misinformation. 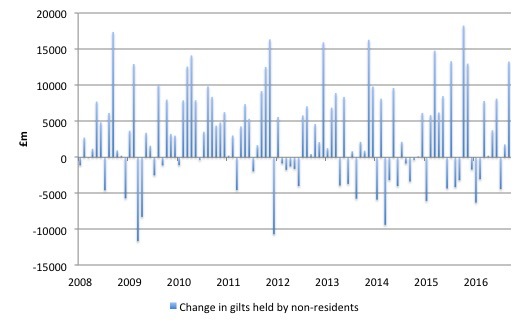 You can get detailed data on the monthly movements in gilt holdings by sector etc from the Bank of England – go to the statistical database and search for “Monthly adjusted changes of Central Government issues of sterling gilts held by non-residents (in sterling millions) not seasonally adjusted” (or series LPMB9P6). The following graph shows the monthly movements since the onset of the GFC (January 2008) until the end of September 2016. You can see there is considerable shifts between months in these holdings. The next graph focuses on the more recent period (since January 2015), to bring the Brexit vote period into more relief. 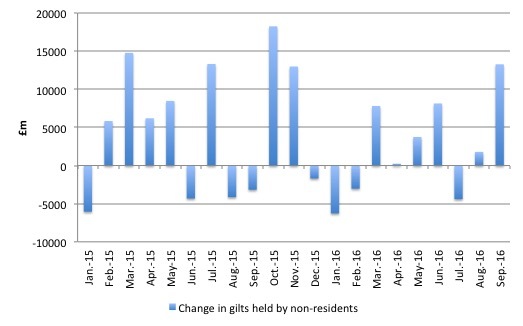 In the month after the Brexit vote, non-residents sold off gilt holdings of £4,403 million. In August, there was a reversal of £1,793 million in purchases and in September, foreigners boomed back into the British bond market with a £13,272 million buy up. 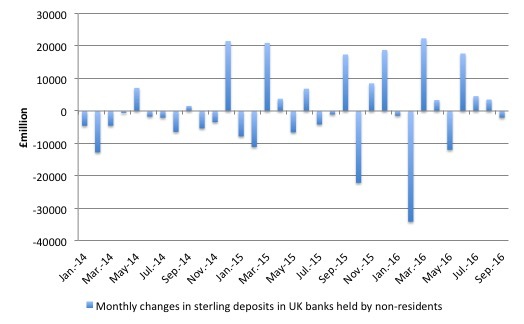 If we examine the Monthly changes of UK resident monetary institutions’ (excluding the central bank) sterling deposits from non-residents (Bank of England series LPMB2VG) we get a feel for whether foreigners are dumping the pound in any significant volumes. The following graph shows the data from January 2014 to September 2016. The data show that not many actual flows out of Britain have taken place. Britain is a developed country with liquid financial markets that issues debt in its own currency. Unlike Greece or Spain, which could certainly run out of euros, the U.K. can always print more pounds. Moreover, the central bank will always stand ready to purchase government bonds if the private demand falls. In doing so, it can always control yields and drive them to zero or whatever should it choose (a core MMT proposition). 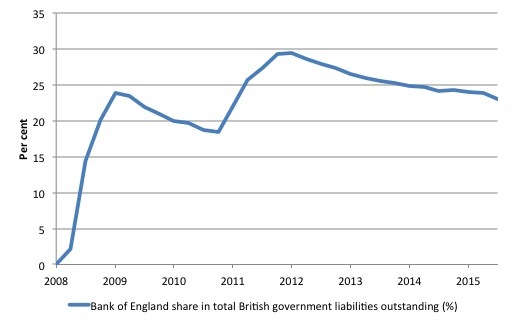 The following graph shows the Bank of England’s share in total British bonds outstanding since December-quarter 2008 (when it held zero central government liabilities). By the June-quarter it had accumulated £429,323 million. Between the December-quarter 2008 and the June-quarter 2016, the Bank of England purchased 34 per cent of the total change in British central government bonds issued. It now holds 23 per cent of the total debt outstanding. While the independence of central banks—a choice states themselves have made—is often highlighted as a counterargument to the notion that currency-issuers never have to default, their operations in money markets are done through government bonds and bills, ensuring a liquid and stable market for them. In fact, the role of central banks has always been intimately tied to managing the government’s debt. And, as the graph above shows – the central bank can purchase whenever it likes (the spikes are its QE program) and as much as is available. Even in the eurozone, the European Central bank has shown it has the power to end bond selloffs. I have made this point often – the ECB saved the Eurozone from collapse in May 2010 when it introduced the Securities Markets Program and started buying up distressed Member State debt. Immediately, the bond markets were dealt out of the game and the ECB pushed spreads down rapidly (against the Bund). 1. Buy all the outstanding government debt and write it off immediately without any negative consequences. It should. 2. Fund all Member States deficits to help growth return. It should. Even the WSJ is now recognising that reality. It also mentions (as above) how the criminal credit-rating agencies are irrelevant and the example of Japan proves that to be so in no uncertain terms. All of these propositions, observations etc are core MMT knowledge. They are denied by most mainstream economists. Perhaps now the WSJ is starting to crawl out of its neo-liberal hole and provide some better understanding of how things actually operating, the denials will fade into the ether. Certainly, core MMT knowledge notes that “Because sovereign bonds are as safe as cash”. There is no risk of default on financial grounds. Even the WSJ now acknowledges that. “In a modern monetary system with flexible exchange rates it is clear the government does not have to finance its spending so the institutional machinery is voluntary and reflects the prevailing neo-liberal ideology – which emphasises a fear of fiscal excesses rather than any intrinsic need for funds (of which the currency-issuing government has an infinite capacity….. This is Micheal Hudson’s FIRE sector collecting the free lunch identified by Fred Harrison which then leads to the collection of the economic rent identified by David Ricardo in his law of rent. It is collecting society’s surplus in the most risk-free and effort-free manner. Feudal capitalism. Basic human nature and an exorbitant privilege to be protected at all costs. I expect you know Micheal Hudson and Fred Harrison personally from you many travels and conferences. That plus the compulsory pension contributions is how we keep the illusion of a private pension system going – when in reality it is an outsourced private taxation system with lots of middlemen skimming their income off the top. I’ve never been sure why we have a state funded Job Guarantee for life insurance company employees, but nobody else. I saw that article but it was behind a paywall. It does mention “borrowing in their own currencies” So thanks for the rest of it here. It does complicate matters when Treasury itself is a source of misinformation! No doubt that is entirely deliberate, [can’t have the public know the reality] I don’t see the WSJ article will make any difference to that. A bright child could learn the basic principles of MMT in a few days and would then be more competent and qualified than nearly all the current central bankers. As the central bankers are generally not fools, but nevertheless have been incorrectly educated, they simply must be either very naive, spineless groupthink conformists or liars and cheats that knowingly implement a political ideology that we call neoliberalism or monetarism that’s primary purpose is to further enrich the capital controlling elites. There is talk about private public partnerships being major beneficiaries of this and there has been no job guarantee offered,but they will be spending a lot more for several years to come. When Bill implies that infinity minus one cent equals infinity, this is completely right. In fact, infinity minus any finite number, no matter how large, equals that same infinity. The same holds for the other standard arithmetic operations. The situation alters under some exponential operations, but they are never relevant in this context. Since we are dealing with money, the set of numbers we are dealing with is the set of Real numbers whose cardinality (size) is stipulated to be c, standing for the continuum. A continuum is considered to possess no “gaps” (though strictly speaking, they do exist). Infinite sets have some odd properties; for instance, restricting the context to the set of Integers, the set of odd (or even) numbers equals the set of all numbers, that is, each set has the same number of members, though it looks as though one set should be much larger than the other. This is quite unintuitive. Hence, mathematical operations on infinite sets can be quite complicated, but not entirely dissimilar in certain respects to those carried out on interest rate variations. Anyone who understands this should not be concerned about any finite demands on government finances (there is no such thing as an infinite demand), since the government’s pool of funds can never be exhausted. No finite operation can deplete an infinite set. I meant to add that it seems as though the idea that the set of government funds is unlimited, or infinite in principle, is completely unintuitive to many, although, as many of us think, some may be lying about this. If I remember rightly, Samuelson advocated lying about this in order to curtail, even prevent, “excessive demands” on government. No prizes for guessing which well-kept financial secret was divulged to him at that meeting. Oh, to have been a fly on the wall – the look on his face must have been something to behold! I suppose that demands only really become “excessive” when we are talking about real resources in the economy, i.e. when there are no unused/unemployed resources available, and so increased demand after that point will probably lead to inflation. Bill, just to be clear: although as you say, there is no actual evidence of foreign bond holders wishing to dump UK bonds, or of potential foreign holders not wishing to buy them, if the unlikely happened, and they did suddenly all dump them / refuse to buy any more, is it correct to think that this would have absolutely no ill effect on the real situation for the UK govt/ treasury/ economy (even if the financial press would make a fuss about it)? As the great Samuel Clemens wrote, “It ain’t what you don’t know that gets you into trouble. It’s what you know for sure that just ain’t so.” Or if you want a less folksy treatment, it always comes down to the Quine-Duhem thesis, which could be stated as: If you have a hypothesis and run an experiment and the results don’t accord with the hypothesis, does that mean the problem is in the hypothesis, the experimental design, the other hypotheses that are immediately entailed by the hypothesis in question, the scientific paradigm from which these hypotheses were formulated, or with the underlying ontology of natural science? This ambiguity allows near-limitless flexibility to “pass the buck,” at least until scientists get so uneasy about it that a scientific revolution emerges. It’s also important to note, this dynamic isn’t particularly spineless or dishonest, it’s just the baseline experience of knowledge. If you’re going about your life and notice something odd, and allowed that to completely destroy all your existing beliefs—well, I have a friend who’s like that, and I wouldn’t recommend it. That seems to be a prerequisite for Treasury Secretaries too, Andreas. It doesn’t always work but it does in this case. Isn’t that article satire MrShigemitsu?? Jon Crace does satire. Are not sovereign bonds safer than cash, given the intrinsic risk that private banks holding your deposits could become insolvent? According to Frank Newman (“Six Myths that Hold Back America”), absolutely Daniel. J Christensen. Similar signs are being seen in Australia as well. The Reserve Bank governor(s) have suggested some fiscal stimulus spent into well prioritised infrastructure (as well as the usual neoliberal austerity in regard to social welfare) to get growth rates higher. The Conservative government is in paralysis mode however with no infrastructure spending yet being announced and apart from big defence spending projections on local naval ships and other bits and pieces, just appear to be keen to serve the interests of their corporate masters in the fossil fuel, mining in general, financial services and property speculation sectors. Quite frankly I can’t see the point of all the defence spending if China is defining our free trade policy, forcing out all manufacturing and is buying what little of value is left in the country such as real estate, farms and infrastructure. Industries continue to close on a truly major scale due to crazy free trade agreements with low wage and high tech. East Asian countries and unemployment is rising and will soon be very high indeed. Why people vote for these governments I cannot understand? The article on Canada is encouraging in that a bit of Keynesian stimulus into infrastructure is planned but the talk is still of increasing the governments debt (an untruth) and public private partnership investments in infrastructure in my view usually end up providing excessive profits to private investors and increased costs for users, such as road tolls. As the national government is not fiscally constrained it is surely best if the government funds infrastructure and the private sector should stick to providing goods and services. Sean, bring on the scientific revolution! Bob, I think Phil Hammond did genuinely say that in his speech, though in fairness to him (Ha, not often I’ll say that! ), it was in the specific context of him meeting leaders in the UK’s high-tech sector and being amazed by some of the things we design and build here. However I remember at the time commenting that judging by the rest of his speech it could equally apply to his knowledge of macro-economics, which was a bit of a problem given that was now his job. @Bob: Yes, I realised that the article was satirical. His words, though, were a direct quote. Unfortunately for my argument, it would appear on reading the entire speech, that Hammond was in fact referring to driverless cars, graphene, the Internet of Things, artificial intelligence, 3D printing, virtual reality, advanced robotics etc – and not a revealed truth about how sovereign money is created – so, yes, disappointingly, I’m still at fault for jumping to conclusions, having failed to read the original speech in full. Sorry! Things are clearly still evolving in the direction of expanded corporate welfare at the expense of social welfare. The last stimulus came at budget time (the first for this Liberal government) a few months ago and a conservative opposition have correctly been able to scream that “not a single new job has been created”. The number of job vacancies per unemployed person actually appears to have declined in the past year. Furthermore, they claim the infrastructure program is in need of foreign investment to multiply the stimulus effect and will be creating a new development bank to facilitate this. When we’ve come to expect the trade agreements (CETA, TPP etc) with their investor court systems were going to become the biggest source of spending (due to lawsuits over lost imaginary profits) though, this new move will make most Canadians feel that there is hope for change going past the next election in three years. Like you I have no illusions, especially in light of the continued use of the national debt boogeyman as a political hot potato, and the promotion of the P3 model. What this does seem to be, as you have suggested is a way to create a lot of rentier opportunities, this seems to be the last imagined way to permit further reproduction of the capitalist mode of accumulation; and that means we’re still going down the path set by the neo liberal thinking that no one in politics acknowledges being a party to. My fear is that this may be the next assault by neo liberals on the idea that deficits can create improved economic conditions. If the product of all this stimulus is a bunch of toll booths on the economy and an otherwise poorly functioning economy from the perspective of the majority, they will claim it’s just further proof the Keynesian stimulus doesn’t work and there is no alternative to further austerity. It’s really looking like a corporate takeover of the nation states in the making. ?????? where is he getting THAT???? John Armour: Treasury Secretaries are so important, they have to be specially brought in from outside treasury, just in case! state will still be resisted. Inflation fears would replace state bankruptcy fears as the neo liberal weapon of choice. In my rather limited experience, people from outside the MMT paradigm who concede this point nevertheless make two major errors that end up negating the implications: 1) they fail to acknowledge that governments in effect ‘print more pounds’ every time they issue debt and treat it like a special case, and 2) they think that ‘printing more pounds’ is an emergency measure only that the government should never employ except as a last resort. Balance budgets and reduced government spending are always seen as the better options. We see this happening now in Canada. Trudeau made the election promise of deficit spending to boost the Canadian economy, but he has already reneged and has become a deficit hawk. His latest neo-liberal plan is to ‘fund’ infrastructure projects to boost the economy by selling off existing government-owned infrastructure, specifically the nation’s airports. More likely than not the purchaser of the airports will be the holy grail known as the ‘foreign investor’. wouldn’t be so sure about this. whats the old saying, if you had to choose between a stuff up and a conspiracy , you would bet on a stuff up all the time. I have had many an interesting convos with advisors and current government polies that sit on various committees, and I can tell you they have very little idea about sectoral balances, or the concept of central bank infinite liquidity. the brilliant folk at treasury understands these things, but perhaps they would rather not go there while the capital account and the banking system gives them enough wiggle room to not go there. Mahaish. The low level political functionaries may be ignorant, or dumb enough to believe their own neoliberal propaganda, but those who control the parties are working to someone’s agenda. Follow the money, those who are getting rich are probably setting the political agenda. It was probably always like this but now lobbying is so powerful and mass media manipulation so pervasive that democracy has just become a game to select the most popular mask for the same corrupt machine. I think Bernie Sanders was outside of this corrupt machine as are the international Green movement and Jeremy Corbyn is also building grass roots power in the UK Labour Party. Trump is a non conventional reckless outsider that has at least exposed the betrayal of the U.S. working class by all governments since the early 1980’s. Brexit, and other exits will hopefully trigger the dissolution of the Eurozone and one day Jean Claude Juncker and similar may be publicly guillotined (metaphorically of course).